[Nino]: "I use the old Honda HPP 125cc engines with Mugen kits; these old engines have superfast cylinders and they are all in top condition. They are still running very strong even though these cylinders are from around 1990! One of my other bikes is a 1998 CR 125; they are very similar engine wise; both plenty fast, faster than many of the new bikes. My main bike is a CR 125 AF with the chassis of a CRF, air forks, etc. ; the engine is a 1990 HPP with Mugen cylinder. Yesterday, I installed the STIC metering block in my PWK Air striker. This was my 1st track test using the STIC metering block. I went spinning some laps on a track over here in Switzerland. I went with the usual 38mm size *Keihin Air Striker. I already posted the video with the engine running in front of my house. This was the first test of real riding on an outdoor track with the STIC metering block. Track conditions; super hard pack with dust on top, steep up hills and downhills. This is not ideal for a hot 125....even less if your engine is already mid-top oriented like mine. If the STIC system performed as claimed, this would be very dangerous. In the video you will see I was very cautious until I was on the straight part of the track as I got use to the acceleration and over rev I became a little more confident. On the track, I could tell immediately that up-top it would pull harder; it had an over rev like never before; to the point I felt the engine would get ripped apart. The STIC metering block paired to a super high-revving engine; it seemed that the engine was going to explode under the seat. It really pulled with authority. Oh boy it pulls and revs to the moon up top. The kind of over-rev and pull it creates is insane. As is - with just the STIC metering block; I gained top-end with awesome over rev, no loss elsewhere. I can just imagine riding this setup on a fast track with nice berms and some tacky soil....ah - killer! As mentioned - the track was super hard pack with dust on top and steep up- & downhills so definitely not ideal for this kind of 125cc STIC power. If I stayed in full throttle it would spin out of corners; as you can see I slowed down for the corners as the speed and over rev was incredible. My PWK Air-striker with the STIC metering block was finally superior to my old PJ where I ran the exact same carburetion for the last 23years. First run of my Honda CR 125 1998 (with '91 Mugen kit) with STIC Metering Block installed in my 38mm *Keihin PWK Air Striker carburetor. [Nino]: "Runs super clean and crisp. Pulls hard mid-top with insane over rev and no loss elsewhere at all, insane revs." ©2019 STIC Super Torque - All Rights Reserved. WARNING: THIS STIC METERING BLOCK IS DESIGNED FOR RACING ONLY; DUE TO INCREASED HORSEPOWER AND ACCELERATION; IT REQUIRES THAT ONE USE +98 HIGH OCTANE FUEL ONLY WITH THIS PART. Note: due to the intense power created by the use of the STIC Max racing metering block, and Max STIC tube; the engine should be in good working order to withstand the STIC's tremendous increase in horsepower, torque, and acceleration. Due to intense torque increase; it recommended that you consider using a high pressure gear box lubricant such as "Oil Extreme." For your gear box protection, a two-ounce bottle of Oil Extreme" will be included in each purchase of the STIC metering block that includes the STIC needle jet tube. A new milder version of the STIC metering block and its related tamer STIC needle jet will be available for hot trail. Legal Disclaimer: *The new STIC metering system insert is not made by Keihin; Keihin and Air Striker are registered trademarks of the Keihin Corporation. 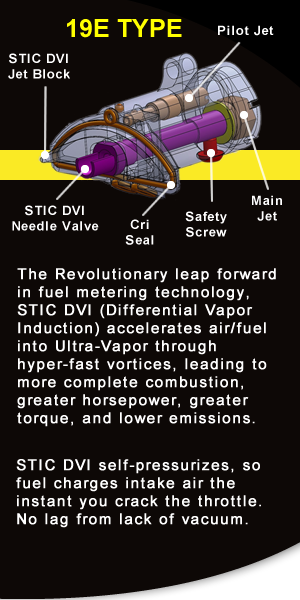 STIC is an individual US company that designs replacement metering systems and other products. STIC has their STIC® name emboldened on the STIC products. STIC has no relationship with the Keihin Corporation. Disclaimer: All information is deemed reliable but not guaranteed and should be independently verified. STIC Super Torque and By Request Web Designs shall not be held liable for any typographical errors, misinformation, or misprints.